Got carpet? Whether you have wall-to-wall carpeting or just a few rooms carpeted in your home, you'll appreciate these tips for caring for carpet. Here, you'll find the best and worst carpet cleaning products, homeowners' favorite vacuum cleaners & steam cleaners, plus outside-the-box ideas for decorating with carpet squares and carpet tiles. For those household issues that can affect your carpet (like burning candles and having pets) -- see when to hire a professional carpet cleaning service instead of cleaning carpet yourself. My Review Of The iLife Robot Vacuum Cleaner… In A 3,700 Sq. Ft. 2-Story House With 3 Dogs! I have both, an A8 model and a V8 model of the iLife robot vacuum. (They’re about half the price of a Roomba iRobot vacuum!) I use the A8 upstairs where most of the rooms are carpeted, and I use the V8 downstairs where we do most of our living with 3 dogs in the house (and have mostly hardwood flooring and lots of throw rugs). Here’s my list of the pros & cons of a robot vacuum cleaner vs. a traditional upright vacuum cleaner, and how well the wet mopping feature works on an auto vacuum cleaner. 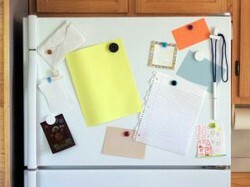 Mr. Clean Magic Erasers: Creative Uses For These Household Cleaning Blocks That Truly Work Magic! A list of a zillion great uses for Mr Clean Magic Erasers from people who actually use them. See what makes a Magic Eraser cleaning block work so well & what this magic sponge is made of. What’s the secret that enables Mr. Clean Magic Erasers to work miracles? Should you buy a house or rent one? 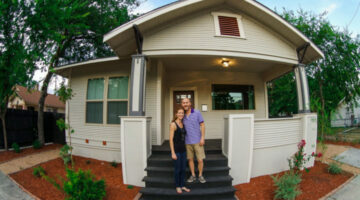 The hidden costs of home ownership were eye-opening to me when I bought my first home. Read this before buying a house. Cheap Home Decor: 20 Clever Ways To Use Carpet Tiles On Your Floors, Walls, And More! 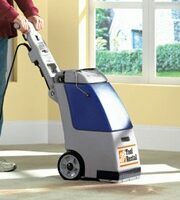 For the past 12 years, I’ve been using an Oreck Compact Canister Handheld Vacuum. It’s kinda clunky, slightly noisy, and has bags that need to be changed all the time. So I set out to find a better hand vac. 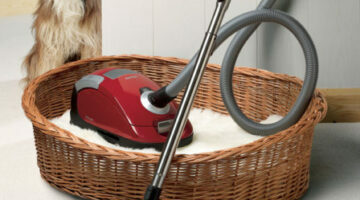 Here are the best hand vacs I found for vacuuming hardwood floors – especially pet hair and stairs. Here’s how, why, and how often you should clean your air ducts — especially if you’ve recently remodeled, live in an area where there’s new construction, or have a lot of pets. Earlier, I wrote about the life expectancy of home components — things like appliances, doors, flooring, faucets and fixtures. 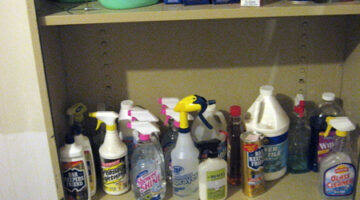 Now, here’s how long household products last — including cleaners, electronics, furniture, bedding, carpet & rugs. I’m here to tell you that sometimes doing it yourself does not pay off. In addition to paying to rent the carpet cleaner machine, and the carpet cleaning solution, three of us spent 2 days moving furniture, setting up fans, and maneuvering this HUGE machine to get our carpets clean. We lost a lot of valuable time. And we’re all sore! Clorox Clean-Up, Scrub Free Soap Scum Remover, Barkeepers Friend, Windex, Fantastik With Oxy Power, Lysol Tub & Tile, Lysol Toilet Bowl Cleaner, Murphy’s Oil Soap, Mr. Clean Magic Eraser, Stainless Steel Magic, and Formby’s Furniture Polish. What Are Those Black Lines Around The Edges Of My Carpet? Ever wonder what those black lines are along the edges of your carpet — at the baseboards and under doorways? The black stuff that looks like soot is called ‘filtration soil’. Filtration Soiling comes from dirty air ducts — among other things. Here’s what to do about it. Bissell Carpet Cleaners Are The Best… Especially The Bissell Proheat Steam Cleaner! All about my favorite house cleaning products: the Bissell Pro-heat steam cleaner, the Oreck vacuum cleaner, Tech stain remover, and Air Delights air deoderizers.